BI Material PP Upper Cuff: A reinforced rear, lateral insert enables the use of a softer front cuff for improved leg wrapping and progressive flex. 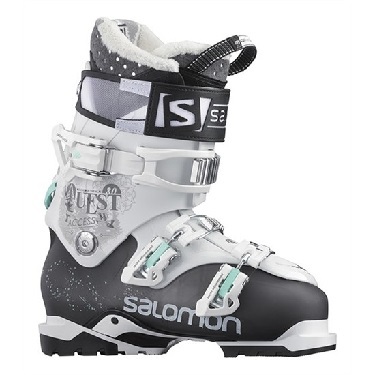 Single Canting: Canting enables cuff alignment to the skier's lower leg shape. Single canting allows the cuff to be moved towards the interior. Backbone Release: Magnesium piece linking the cuff to the shell providing solid back support & rebound and a progressive forward flex when locked. When unlocked for hiking, releases the cuff on the back for a wider opening and easier hell to toe transition. My Custom Fit Sport: Thermoformable foam on the ankles and the tongue for a personalized and durable comfort. 2 Micro Alu + ratchet buckles. Anatomic cuff with lower rear support for women's calves for better fit & comfort.